Since its introduction as the first practical vacuum veneer press, woodworkers have praised this original VacuPress model as a reliable performer. Today, the Professional Vacupress® Pump is still the number one choice of woodworkers everywhere. An excellent entry-level VacuPress®, as well as a dependable choice for the woodworking professional, the Professional VacuPress® Pump handles the full range of veneering and laminating tasks with ease. Designed and thoroughly engineered to be a maintenance-free performer, the nucleus of the Professional VaucPress® Pump is a 1/3 HP 6 cfm dual chamber rocking piston pump chosen for its industry proven performance. The Professional Vacupress® Pump vacuum is controlled by a state of the art, precision, “repeatably accurate”, digital vacuum switch for maintaining consistent vacuum levels. Easy to read, easy to adjust, our digital switch allows you to set both the vacuum pumps shut off and turn on points, independently from each other, providing infinite adjustability. This allows variable vacuum settings necessary for the various pressure needs of high elevation woodworking shops, curved woodwork work, and different types of veneer and laminating adhesive. It also features a dual power switch for both vacuum pressing and vacuum clamping. In the press mode, the vacuum switch will automatically shut the pump off when the proper vacuum level is reached. In the clamp mode the pump operates continuously as a shortcycle hold down clamp for wooden parts. 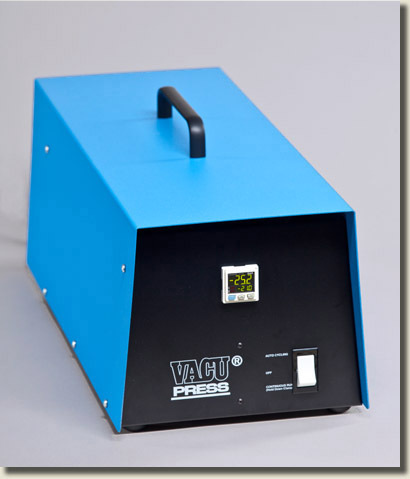 The Professional Vacupress® Pump model can operate up to three bags with the addition of our manifold adapter. For orders outside the U.S. and Canada, please contact us. We’d be happy to send you our latest catalog of vacuum pressing products and accessories, or answer any questions you might have about any item we sell!